sleepers, rails and stone going in all directions. requirements for the big attack on Fishplate greasing and bolting up. This task will involve many hands over the next few months. home for the Power station. is now going off with the bolts for the gate posts cast in place. Rail, CTRL, London Ambulance to see the emergency vehicle in action. attendance. I firmly believe that further new business will result. Special Events 2008 now online! As the official website of the Ecclesbourne Valley Railway, we are proud to bring you the new 2008 Special Events information first! Usually, we wouldn't make such a fuss over the events calendar, but this coming year contains arguably the most important event in our short history - the opening of the line between Wirksworth and Idridgehay. This is the start of the big break out of the Wirksworth area. Whilst full details of this event will be released in due course, the dates are pencilled in there for you to browse! As it is likely to be busy that weekend, travel on the train must be pre-booked and details of how to pre-book your journey will be released shortly. To view the events for 2008, please use the "Ticketing and Trains" link at the top, followed by "Events 2008". The Pasenger Dept had a stocktaking day and also had several visitors. Hannages, as well as concreting . base by rail, where they were collected by the Council. Again, a day of great activity with the late running of today's customer giving us the opportunity to put some ballast down on the Wash Green to Gorsey Bank section and then dribble what was left along the stretch opposite Bournebrook Avenue. Whilst the standard gauge was being ballasted a team were also ballasting the narrow gauge with an assortment of equipment including a mini digger, dumper and fearsome wacker plate. Roy(71) and Les(77) together with Chris (21?) made steady progress with the interceptor pit and we welcomed a visitor from the Aln Valley Railway who may purchase our redundant Permaquip fleet. Further preparation of the Idridgehay gate posts was undertaken. The Booking Hall was kept busy with our visitors and the usual phone calls. pit until the interceptor is finished. cleared to show it off as a feature. be cleared of mud around mileposts 139 and 140. Our normal day for reflection and exploring the meaning of life was greatly disturbed by activity. Early bird boffins reviewed the infrastructure needed to restore and upgrade our web cam system and usefully ensured another early bird delivering materials to Roy (71) and Les (77) for the interceptor pit found them and their deep hole. Special thanks to David Newby and Hylton who shunted the yard so we could accept three hopper wagons full of ballast, put Sir Peter where repairs could be effected, marshalled the ballast train for Monday and repositioned the Incline train ready for tomorrow. The week's work for our hired in digger and driver finished with a clean up at Gorsey Bank and the preparation of walkways either side of the crossing. We have been very pleased with the productivity of this machine and driver and will certainly use them again in the future. Roy (71) and Les (77) completed the concrete base of the interceptor pit and are ready for the next part of the plot. The children's play area work continued and the Booking Hall welcomed a number of visitors who were entertained by the ballast being tipped in from the Wash Green dock (repeating history).A young offender and supervisor made sterling inroads into platform cleanliness and the area around the Training Room. The icing on the cake was a very late booking from a customer who was with us this afternoon nearly generating enough income to pay for today's stone delivery. All in all, a satisfactory day. A day of steady achievement with further green paint applied to the Incline dmu and more energy expended on the children's play area. Stone was delivered for the narrow gauge and the site of the oil separator pit grew ever larger reaching the footings of the old engine shed. The Idridgehay gate posts were drilled ready for delivery to site and the VCT had a stock take of their timber stone removing many nails for our scrap drive. The Ravenstor service operated with modest success and the Booking Hall welcomed passengers and visitors. The permanent way team ventured to Duffield to commence repairs to the tight curve into the station that has been causing concern. The gauge tie bars that we recently purchased have proved of great help in this process. Our mini digger driver continued with ditch digging in the Callow Park area to great effect and it was at the end of the day the excitement commenced. Sir Peter expired with the works train a little way north of Idridgehay. The works train contained the vehicle that would return the digger to Wirksworth ready for its activities at Gorsey Bank tomorrow. A classic rescue was mounted with the staff returned by road to Wirksworth and the rescue train conducted to the failure in the approved manner. Protection of the failed train was provided and the whole consist proceeded north to collect the digger and the process into the car park to permit the digger to be unloaded. As darkness had descended the whole combined train was berthed in the car park overnight to be sorted tomorrow. We have 60 tonnes of ballast being delivered tomorrow so will need to reorganise ourselves to cope with this and restore the Incline train to its position for Saturday. A very good effort by all concerned. the new gates, the holes are now nearly ready for a some concrete. trapped water, work continues there tomorrow. digger up on the return journey. Works train to depart around 0930 ish. completed the assembly of the Idridgehay level crossing gate posts. area had a dressing. A start was made on levelling the spoil heaps. the gate posts (travel by car please). Also some more testing work. Passenger trains will also be in operation. levelled and now awaits some Type 1 to be laid and wacked in. station to have a look around. Exclusive discounts on Norton Security from Tiscali http://www.tiscali. What a very pleasant day with the crowds filling our three platforms to enjoy the dmu fest! The sight of simultaneous departures and arrivals at Platforms 1 and 2 was something to behold. These events coupled with the Bubble Car arriving and departing from Platform 3 created an environment worthy of some of the major stations on the network in the 70s. Many congratulations to everyone who made it all happen including the marshalling and shunting well into Saturday evening and an early start today. Also thanks are particularly due to Julie who did record business in the Buffet Car and Jamie, aided by the Youth Offending Team, who undertook that most unglamorous but essential job of packing the car park. There was also a sizeable team manning the 3 locations of the Model Railway Exhibition and Mike and Pat Craft deserve a special mention for pulling the whole thing together after another 12 months of planning and negotiation. Yet again the town of Wirksworth is put well and truly on the map by the endeavours of the Railway. All this effort engaged around 30 volunteers. including some pressed men and women, which again demonstrates the dedication of all involved and there was even an opportunity to tend to the drainage at 40 steps and fettle the radiators on the Class 31. A very well done to everyone. all who have helped at the venues, at the station and on the trains. vehicles and on the Gat Ex. A less frenetic day but with an earning opportunity! A regular customer developing and electric powered machine claimed further improvement as the vehicle travelled to Shottle and back without incident. The Amber Valley Loco Group topped up Margaret-Ann with antifreeze and started to prepare the Maintenance Facility site for the arrival of a new stores container. The Incline dmu received further attention as the sun warmed the day up and there was a great deal of activity in Wirksworth town to prepare for the Model Railway Exhibition opening tomorrow. The Booking Hall entertained quite a few visitors amongst which was a Railway Inspector paying a "social" visit. He commented on our standard of presentation and lamented that the railway he was involved with did not have the same approach! I am not sure whether there is enough cyberspace to report on today's doings! However, I will try - the VCT have had a day of good housekeeping with a panel of Midland Railway fencing recovered on Tuesday being reshaped for use on a bridge parapet. Their stores have been re-organised and surplus items disposed of. Galvanised chain that had disappeared from sight was uncovered and applied to the fence line at the base of the former dust dock to create a nice finishing touch. The steps were replaced onto Helen-Louise and blocks moved to prepared for the creation of an interceptor between the pit and the site drainage system. This will continue the improvements in the Maintenance Facility area. Two gate posts were fabricated for Idridgehay and a defective sleeper was changed at the site of the trap points on Road 2 to enable the ground frame installation to be completed. The works train was marshalled for its activities next week in support of further machine work at Idridgehay, on the "racing straight" and at Gorsey Bank. Providence prevailed with the availability of the "new" fork lift that was able to discharge quite a substantial capital investment in rail, sleepers (for the narrow gauge), chairs and gauge tie bars totalling over £3000. The scrap gathered from the level crossing installations was sorted, cut and skipped where appropriate. The silent talking tunnel was restored to life and a potential new recruit given an insight into the likely tasks ahead. This recruit will be accompanied by a lady that may cause pacemaker batteries to need a recharge. We were pleased to welcome a paying guest for testing and L53 was in action as part of the EMC evaluation for the vehicle. We were also happy to host Jonathan Webb from Rail Engineer, a loyal supporter of the enterprise, who was entertained by Mark Brooks from Tube Lines with the bonus of our other customer on site for an article about our commercial activities. PS Many thanks to Neil and Leigh for bringing our web sites back to life - the new look is excellent! Another day of great endeavour with L53 undertaking EMC testing on the TBTC track leaving the battery locomotive blinking in the autumn sunshine. The permanent way team completed all the new signage for Gorsey Bank with the exception of the Up fixed distant. They also recovered all the, now, redundant signs and scrap from the old installation. The drain south of Gorsey Bank crossing was unblocked following the various earthworks in the area and is flowing well amongst the white goods deposited outside our boundary there. A mammoth move of sleepers from the Flatrol freed that vehicle for activities next week and lift plates were fitted to a particularly bad rail joint on the Hannages. I forgot to mention yesterday that the gate hinges were fabricated for the Gorsey Bank gates and we await the road/rail machine and trailer that will transport them to site and assist in placing the gates into their final position. The Passenger Services team assembled for a meeting to review their activities and the Booking Hall received a few visitors. Another day of activity on many fronts. The VCT were earning money for their next chain saw by undertaking a little contract work for the Tube Lines project to enable specialists to take sound and electro-magnetic interference measurements on the TBTC test track over the next two days. Meanwhile, the permanent way team finalised the new signage at Idridgehay by fixing the Up distant signal board. Whilst at Idridgehay the team undertook some drainage work and ballasted either side of the crossing. After that work was complete the team moved to Gorsey Bank to remove redundant signage and treadles. They then turned their attention to the new signage with some put in place and the sites for the remainder identified. The Booking Hall welcomed a possible new recruit to their team and the Mess Hall was restocked with the essentials of life. Geoff Adam's celebrated his birthday by the provision of a splendid Thomas cake. The final touches were put to the Passenger Services budget for the next financial year after a great deal of background work by all concerned. All in all, another great day. A day of sorting the diesel multiple units out for the weekend and a little light maintenance on Faraday. We plan a dmu fest! on Sunday when all our services will be operated by dmus including the Incline. The 2 car Met-Cam will be operating non passenger demonstration runs from Platform 2. Much admin and planning took place and the Booking Hall entertained a few visitors. A pleasent on many fronts in terms of the passenger service a quietly profitable day,with a visit from the 18c club 41 in all with tea / coffee on the Gattex they all had a pleasent day. Much interest in the Tube Lines battery engine. Activity has been on several fronts during the day with a limited number of volunteer's. Collected up clips, nylons and pads at foot of Incline and placed in new bags. Track patrol yard and incline, knocking in Keys. Cleared drains north of Idridgehay as far as outflowing culvert. A day of some curiosities. We were not able to get to grips with the task of sorting PW materials, as today was a conscript free day. However, much progress was had by engineering with work done on the Lister, on wire brushing and painting various parts of 03084 and on the ventilation system of the class 31. In terms of the passenger service a quietly profitable day was had and in the intervals repairs were carried to the Booking Hall and some spring cleaning and lite gardening were done despite a damp start to the day. At Duffield various material was reported to have been cleared, bagged and moved from the platform area and work done to tidy up the down slow platform and the general area of the compound, I do not doubt a full report will be made available presently. In the afternoon the Penguin was returned having made a bid to escape at 1.00 am last night accompanied by an assortment of the Feckless who left it in the middle of North End while attempting to make off with a number of toupees from the hairdressers. The said Feckless were last seen heading up the M1 towards Sheffield, allegedly pursued by a bobby on a bicycle from Matlock. The Penguin has now been chained to the revetment wall of the Children's area using the largest chain in Christendom and tonight the footpath and main road gates are to be locked. A pleasant day in the autumn sun allowing further painting of the Incline dmu coach. Progress was made on the enhancements to the children's play area and the road/rail lorry received attention to its electrics. The Booking Hall welcomed a few visitors and the Buffet Car was prepared for the entertainment of a group on Sunday. Idridgehay level crossing was reopened to road traffic and many congratulations are due to everyone involved in delivering this project on time and under budget! It has involved a great deal of work over the last fortnight and we won't have to do it again for another 30 years (I hope!). Duty Managers for the weekend are Anton, Saturday and John Ball, Sunday - the key task being the rebagging of all the small permanent way materials resting alongside the Incline for transport to Shottle to enable the Maintenance Facility project to restart. Another day of sterling endeavour with all but one of the Idridgehay signs planted just leaving the Up fixed distant to do next week. All surplus posts and scrap have been moved from the Idridgehay site and much unwanted timber has been consigned to potash. Temporary blue fencing has been erected until such time as we install the crossing gates. Back at base the trap point ground frame for Road 2 has been concreted in and various technical things attended to. (We do need to source an Annetts key - please check your loft/garage). The logging department was in production and some narrow gauge rail cut to length. More component recover took place from Wee Yorkie and the Booking Hall received a number of visitors. There has been as pleasant surge in bookings for MyTestTrack over the next three weeks. Two main activities involving two different departments. Firstly the Loco engineering section had the blue 03 in the Maintenance area and removed one of the connecting rods, which showed some wear, this was despatched to Butterley for machine work to be carried out on it. On the ajoining track more work was carried out on the Incline coach. A visitor from Boston (US of A I believe) had a trip on the Incline train. He was so keen that he made a handsome contribution to costs. - me - wagon - sir, was dropped beside the track in the area which will become the staff car park (AKA Idridgehay Park and Ride). Most of the new fixed signal boards were planted along with speed boards, just the Up Fixed Distant and a speed board to be added there. The Treadles were removed carefully and all bits retained for storage. The works train made a welcome return to Wirksworth traversing the new level crossing several times during the day.The old signalpost that has been on the platform these many years was removed as well as the Up Home post. Many local residents from Idridgehay dropped in to see the progress. The Wirksworth Tourist people held a meeting at the station, after which the Wirksworth Station Master paid a visit to the workers at Idridgehay. More bodies required for tomorrow to erect the last of the Signals as well as recover redundant assets. Due to heavy rain, no tarmacing took place at Idridgehay today, which now puts us a tad behind schedule. However the Clearance team braved the elements, continuing their endeavours in the area. Per way took one of the firewood department down the line so that he could load up some logs to keep their department busy - big rush coming soon. Per way also started the connection of the new Trap point for road 2 to the north of the Platform 2, This has now been positioned, the bench has been dug out and fixed, we now need to mix some concrete to hold the frame in place - very dirty and muddy, and yet such lovely fun! The train was also loaded with signs ready for an early start to Idridgehay in the morning. The massed ranks of 4 turned up at Idridgehay, a few tons of stone were dropped in the Level Crossing hole, and was subsequently whackered. Sleepers were cut around the post holes, and more of the drain was filled in. Paul joined us after lunch and spent all afternoon cutting the sleepers to fit around the rails, to give the council something to tarmac up to in the morning. Tomorrow sees more work at Idridgehay. Train leaves at 0915. All remained quiet at Wirksworth, with a couple of visitors and the usual phone calls offering amazing services. OK, so here's the first foray into the Blogosphere, and just in case its a problem, I've put on my asbestos codpiece. Wirksworth, 7TH October 2007: Tube Lines’ battery-electric locomotive L53 has arrived at MyTestTrack.com’s facilities in Wirksworth to kick-off an 18-month testing programme that will be a part of leading Tube Lines, the company responsible for the maintenance and upgrade of all the infrastructure on the Jubilee, Northern and Piccadilly lines, to increase capacity to allow for faster, more frequent and reliable services to serve London and the 2012 Olympics. The revolutionary transmission-based train control (TBTC) system uses train and track-based sensors to detect the location of trains with higher accuracy than existing methods, leading to reduced headways which, combined with lengthened trains, will lead to an increased capacity and a reduction in journey times. Wirksworth was selected as a test site for engineers’ trains being equipped with the new system. The TBTC signalling system was installed on the Gorsey Bank passenger line during the spring of 2007. The TBTC system is being designed and manufactured by Thales Rail Signalling Solutions Ltd under contract to Tube Lines as part of a consortium which includes Halcrow, Tube Lines and LH Group Services. “This is a key milestone in commissioning new signalling for London’s Underground and we are delighted to be working with WyvernRail to ensure the efficient testing of our fleet of engineers’ vehicles,” said Paul Weidlich, Tube Lines’ Project Manager on the TBTC programme. 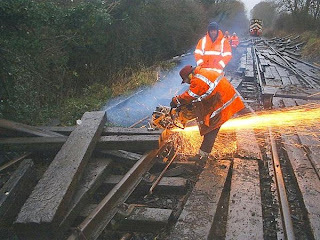 “WyvernRail’s close relationship with LH Group, who are fitting the equipment, combined with their growing reputation, has given us the confidence to undertake this element of testing in Derbyshire,” he added. LH Group received the first vehicle, a battery-electric locomotive, at their Barton-under-Needwood works in May 2007 for fitting of the vehicle on board computer. The locomotive has now moved to Wirksworth for signalling tests and will be followed by a number of other vehicles, such as tamping machines, Schöma diesel locomotives and more battery locomotives that will all be put through their paces on the new signalling system at the test track over the next eighteen months. The plan is for each vehicle to receive up to five days of testing although this may shorten as experience of testing vehicles increases. After satisfactory tests, the vehicles will return to London. Tube Lines employees will be based at Wirksworth when tests are conducted, to drive the various vehicles and ensure the smooth running of the project. Thales, who under their contract to Tube Lines, design and build the TBTC equipment, will be operating the dedicated test equipment at the control centre for TBTC which has been established by Wash Green Bridge in Wirksworth. MyTestTrack.com is a venture by WyvernRail plc. WyvernRail is reopening the Ecclesbourne Valley Railway between Duffield and Wirksworth and, in a very short time, has transformed the line from a neglected wilderness to a clear route suitable for vehicle movements throughout its length. WyvernRail is locally owned and managed with an attitude to make things work. MyTestTrack.com offers competitively-priced service that is available at short notice to railway engineering companies for testing and training. The company offers a single point of contact, including a dedicated rail industry hotline (0870 766 2098), and a range of facilities to suit requirements, whether they be at short notice or for the long term. Full details can be obtained from http://www.mytesttrack.com/. On 31 December 2002, Tube Lines assumed responsibility for the maintenance and upgrade of all the infrastructure on the Jubilee, Northern and Piccadilly lines as part of the largest improvement programme the Tube has ever seen. Together these lines carry 40% of Underground passengers. Tube Lines has a 30 year Public Private Partnership (PPP) contract with London Underground. The contract is output based, meaning Tube Lines is rewarded for good performance and penalised for poor performance. Reversing the effects of decades of under-investment in the Tube is a huge task requiring an injection of resources on the scale of which the Underground has never seen before. Tube Lines is involved in a massive improvement programme, tripling investment and committing over £4.4 billion to improve the Jubilee, Northern and Piccadilly lines in the first 7½ years – the equivalent of spending almost £1.6 million per day. A day in which the priority tasks of shunting and step painting were completed before morning tea was taken. Following morning tea and a bag of fruit pastilles, the staff roused themselves to deal with the interior end screen painting of the platform 2 waiting shelter, and a coat of paint was also applied to part of the platform side of the Booking Hall. Engineers undertook work on the class 31 and 03 084, and D2158 has taken over passenger duties. Clearance was undertaken south of Rowland's Crossing by the white van and egg sandwich department, and a hoodie, sorry, conscipt, was delegated to sweeping the whole of the Station Road gutter. The passenger service trundled happily backwards and forwards all day as did the till drawer. For those of you interested in the film show, there are only ten tickets left. Two new volunteers were welcomed and the magnificence of our endeavour was admired from as far afield as Australia. The priority task for tomorrow is the tidying of the store area between the green trailer car and the Ravenstor line, where various items of small track materials need sorting and bagging properly, bags and sleepers stacking neatly and rubbish removing. Wirksworth, 29th September 2007: Wirksworth Station was upgraded to main line status and witnessed dramatic scenes and a lucky escape for characters in the BBC’s top medical drama ‘Casualty’ broadcast tonight. Only months after taking centre stage in ITV’s thriller ‘Mobile’, the Ecclesbourne Valley Railway has again achieved top billing with the BBC as the scene of an explosive episode that was filmed in June. Wirksworth station was transformed both in appearance and location, partially thorough the work of the BBC’s set designers but also through the efforts of the railway’s own volunteers who have built two new platforms at the station in just six months, allowing the station to take on the appearance of a through station on the main line. The plot for the episode was under wraps until tonight’s broadcast, but the BBC were fulsome in their praise for the high standard of support provided by the railway’s volunteers and management. The filming took place over three days and involved two trains and used scenes at several locations down the line. In addition to using the railway, the BBC crew employed extras from Antony Gell School, giving several pupils the opportunity to appear on the small screen. “We are delighted to have brought Casualty to Wirksworth” remarked Phil Tarry, WyvernRail’s Projects Director. “Our modern rolling stock continues to attract the film and television industry; indeed since we began, our intercity train has appeared under the identities of two fictitious train operators and even German Federal Railways” he added. The railway is now promoting its rail filming facilities under the banner RailFilmLocations.biz and this operates in parallel with the company’s highly successful MyTestTrack.com engineering business. Depicts RailFilmLocations’ express train, as used in Casualty. Depicts RailFilmLocations’ express train arriving at Wirksworth, masquerading as ‘Lightbourne’ for Casualty. Depicts Wirksworth station dressed as ‘Lightbourne’ for the filming of Casualty. Depicts the departure board used at Wirksworth for Casualty. A very peaceful day today after the excitements of the week. A little light baggage trolley painting was achieved, some oil purchased for Helen-Louise and stocks gathered for the evra stand at the Mickleover model railway exhibition. The Booking Hall welcomed a number of visitors. Duty Managers for the weekend are Steve for Saturday and Mike Evans Sunday. Jobs available include the application of non-slip paint to Tube Lines boarding steps south of Wash Green bridge.